One of my favorite ways to save money is by shopping thrift stores. Okay, I’m not telling the whole truth. Thrift store shopping and bargain hunting is actually one of my favorite things to do period. There’s just something about being able to go out and find a great deal on an item you’ve needed. It’s the thrill of the deal hunt and the success of finding that deal that makes people like me love going thrift store shopping or hunt for deals at yard sales. Whether you’re new to shopping at secondhand stores or you’re a seasoned pro, it never hurts to re-think your strategy and find a few new thrift store shopping tips. 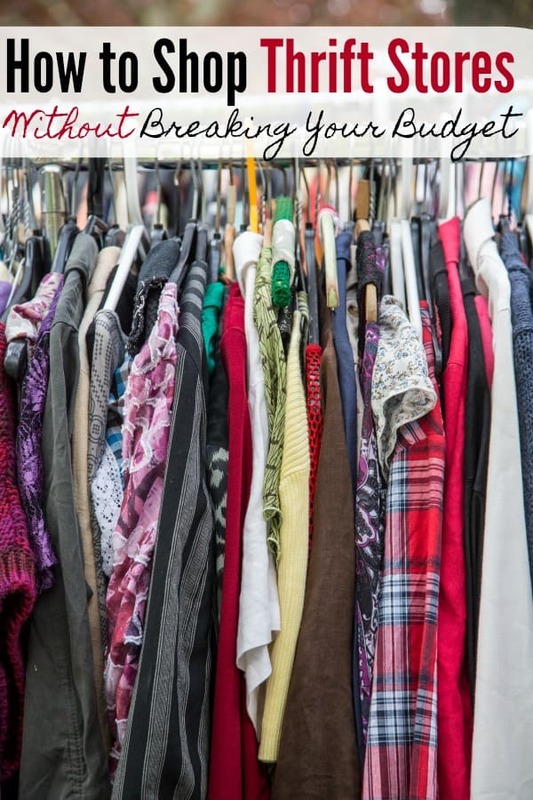 If you’re new to the past time, learning how to shop thrift stores without blowing your budget is sure to not only save you money, but also allow you to have a great time on a budget! When you’re first learning how to shop thrift stores without breaking your budget, it can seem overwhelming. After all, when most of us go shopping, we want to be able to just walk into the store and shop. Thrift stores though can ruin your budget if you don’t follow a few thrift store shopping tips, you can very easily overspend without realizing it since prices tend to be so cheap. I am one of those people who almost always has something I need to buy. In the past year, I’ve lost over 60 lbs which means I’m forever buying clothes that don’t fall off of me. Since Emma and I lived full-time in a hotel for a few months as well, I no longer have the kitchen or household items I need or prefer to have as well. This means that I’m slowly stocking up on these things so I can get them cheap instead of having to drop a large amount of cash on them all at once. Because I want to save as much money, I shop at thrift stores to help keep my costs down. Even when I shop at thrift stores though, I take the time to follow these thrift store shopping tips to make certain I don’t overspend. One of my favorite thrift store shopping tips is to skip the brick and mortar store. These days, you don’t need to go into an actual store to buy used if you don’t want to. A large portion of the time simply staying out of the store will save you more money even if you’re paying shipping costs. Online thrift stores or online consignment shops are everywhere. Even Amazon sells used items and Facebook’s marketplace is another great option. One of myy favorites for clothing is ThredUp. Not only do they have a great selection of clothes for kids and woman, but when you sign up for ThredUp with THIS link, you’ll score a FREE $10 or $20 credit depending on what time of year it is. Schoola is another of my favorites and not only sells kids and women’s clothing, but mens as well! Both will give you free credits which means you’ll save even more. Schoola will give you a FREE $10 credit when you sign up for a Schoola account with THIS link. My favorite for not only clothes, but some household items and even things like movies and books is Swap.com. Not only do I use Swap to make money selling kids clothes online, but I also shop with them quite often. When you sign up for a Swap account HERE, you’ll be able to shop from people such as yourself who are just trying to make an extra buck. Side Note: If you are planning on doing ANY shopping online, be sure to sign up for an Ebates account before you shop. Ebates is a cash back shopping site that will pay you cash back on qualified purchases. Plus, Ebates will give new customers $10.00 in FREE cash back when you create an Ebates account and make your first qualified purchase of $25.00 or more. You can check them out HERE. Like one of the different ways to save money on groceries is to have a list, the same goes for when you shop at thrift stores. Don’t make the mistake of walking into a thrift shop without knowing what you’re there for. If your kids need clothing, go in and make sure you only look at their sizes. If you need a specific kitchen item, make sure you don’t allow your mind to wander. Having a list will keep you on track much easier than if you shop without one. I personally like to use THESE reusable cash envelopes when I go shopping for anything in store. I’m able to keep my cash and my list together so I find I stay on task better than without them. Like any other shopping trip, it’s incredibly important to set a spending budget before you go. If not, you could quickly find yourself shelling out hundreds; especially if you shop at multiple thrift stores. Make certain that you have the money to spare before you even leave your house. After that, make certain you only allow yourself to spend what you’re able to spend. A cheap pair of jeans or a cheap cast iron skillet isn’t worth having to pull your family out of a financial crisis. Side Note: Heading out to the garage sales while you’re thrift shopping? Be sure to grab any of THESE 25 must-grab yard sale finds. You might be surprised at what made our list of must grab. Even though you’re opting to shop at thrift stores, that doesn’t mean you can’t get a discount. In fact, a little known thrift store shopping tips is that thrift shops are some of the best places to get discounts! At some thrift stores you’ll find colored tags on the items. On certain days of the week, a different color will be marked down. At others, they offer discounts for a specific day of the week, bag sales and more. It can be very worth it to take the time and find out which discounts your thrift shop offers. Side Note: Buying your kids new clothes because they’ve outgrown their old ones? Head over HERE and learn how to make money selling kids clothes online. It is a fantastic way to recoup some of the money you’ve spent and to cover the cost of the new clothing. Another little known thrift store shopping tip is that often they’ll have a frequent shoppers reward card or something of that nature to keep you coming back. You can use these programs to your advantage to save even more money at thrift stores. These rewards programs could be anything from spending a certain amount or visiting a specific number of times and they will usually get you dollars off your next shopping trip. One of the best thrift store shopping tips I could give you is to make certain when you’re shop at thrift stores for electronics or anything that has multiple pieces that you take the time to make sure the item works or has all the pieces it should have. If not, you can skip buying it and avoid spending money on an item you can’t use. Thrift stores are great places to find items to resell. Not only can you make money online selling kids clothes, but things electronics, computer equipment, toys, vintage books and more are great items to pick up and resell. The other day, I scored an electronic keyboard (the musical type) and stand for $15.49 total. I resold it for $150.00 making a huge profit. If you’re unsure where to sell your items at, but are like me and aren’t a fan of Ebay, there are quite a few places to sell online that aren’t Ebay you can get started with. Side Note: Want to make money from thrift stores but aren’t sure how to get started? Check out Thrift Store: How to Earn $3000+ Every Month Selling Easy to Find Items From Thrift Stores right HERE. As I pointed out earlier, you should always have a list when you shop at thrift stores, but you’ll also want to take a few minutes to make certain the items on it are actual needs and not wants. Wants are fine to splurge on if you have the extra money, but if your budget is super tight, you’ll want to avoid making any unnecessary purchases. If I could only give you one of my favorite thrift store shopping tips, it would be this one. Taking the time to shop thrift stores for things you may not think of is a great way to save money. When you go to shop at thrift stores, make sure to look at items in a different way. For instance, when we found a chair at a thrift store that needed some love, what happened when we brought it home made it entirely new again for pennies on the dollar over buying a new one. Plus I learned how to reupholster a chair which is a skill I’m sure I’ll use plenty in my life and my thrift store adventures! To put it simply, don’t dismiss a thrift store find until you’re absolutely certain you can’t use it!